HOUSTON (CN) – Governor Greg Abbott said Tuesday that Texas will get $5.5 billion in federal disaster-relief aid for Hurricane Harvey by the end of March, urging local leaders to spend much of those funds on flood-mitigation projects ahead of the next hurricane. At a news conference at city hall in downtown Houston, Abbott and Houston Mayor Sylvester Turner thanked Congress for passing a budget last week that allocates $89 billion in funding to help people recover from hurricanes in Florida, Texas and Puerto Rico and wildfires in California last year. Hurricane Harvey damaged more than 200,000 Texas homes last August, and as months passed without Congress passing a major disaster-relief package, Turner criticized Abbott for not tapping into the state’s $10 billion Rainy Day Fund to jumpstart recovery efforts. But there was no sign of lingering tension Tuesday between Turner and Abbott. They sat next to each other at a table with dozens of state legislators and local officials standing behind them, crowded together for photographs. “Thank you governor, it is always good to see you in Houston and Harris County, when you come bring money. Please come again next week,” Turner said with a snicker. Houston is Harris County’s seat. Abbott said that the Federal Emergency Management Agency estimates that of the $89 billion set aside by Congress, Texas will qualify for more than $1 billion in hazard-mitigation funds, $500 million of which is ready to be disbursed right now, and that FEMA will finalize that funding in late August. 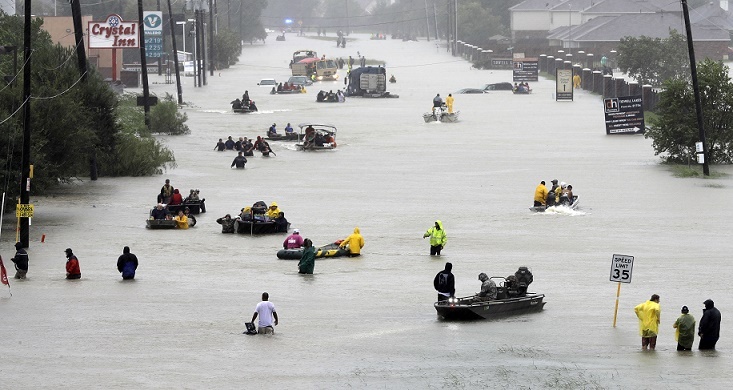 “The final amount of hazard-mitigation funds is based on 15 percent of the total amount of individual assistance, plus public assistance, that FEMA gives to Texas. The final amount actually could be even more than the current estimate if cities, counties, schools and individuals provide FEMA with even more evidence of assistance that is needed,” the governor said. FEMA says the key point of these mitigation funds is to reduce the risk to people and structures from the next natural disaster. Abbott said there is a potential for another hurricane in just a few months, as hurricane season starts June 1. Abbott said that in addition to the $500 million ready for dispersal now, he expects $5 billion in community development block grant funding to be available for Texas cities by the end of March. The $5 billion is coming from the U.S. Department of Housing and Urban Development, or HUD, Abbott said. He said the Texas General Land Office, which will be in charge of administering those funds, is working on a state plan to spend them. Once HUD approves the state plan, there will be a short notice-and-comment period, allowing the public to weigh in on the plan, according to the governor. “HUD will then approve that. We are told that HUD will expedite that. So I expect the $5 billion in community development block grant funding to be available for these communities by the end of March. Now these $5 billion can be used for projects like additional flood mitigation, like disaster relief, like infrastructure, like housing and economic revitalization,” Abbott said. Abbott said the block grant funds can be used to pay for buyouts of homes and to elevate them. Some Houston-area homes have flooded three times over the past three years. In the wake of Harvey, more than 3,500 homeowners in Greater Houston have told officials they are interested in a buyout, according to Houston’s NBC affiliate KPRC. The governor added that the funds coming from both FEMA and HUD can be used for flood-risk management projects like dams, retention basins, jetties and levees. One of most important projects that Texas is working on is a “coastal spine,” a barrier that will be placed in the Gulf of Mexico from Sabine Pass, near the Texas-Louisiana border, to Galveston Bay, to protect the refineries and chemical plants on Texas’ coast from hurricane-driven storm surges. Abbott said that Congress has earmarked $3.2 billion of the disaster relief funding for the coastal spine, but he did not give any specifics about the project, which will not protect the region from a heavy rainfall event like Harvey. The governor also addressed the controversy over the state’s Rainy Day Fund. Texas school districts are largely funded by property taxes. Abbott said he does not want to deplete the emergency fund because it will be needed to make up for tax revenue school districts lose from homes damaged by Harvey. FEMA pays for 90 percent of debris removal in disaster zones. Abbott said Texas is covering the 10 percent share that every governmental body in Texas had to pay for debris removal with the Rainy Day Fund. He also said Texas wants to keep the fund intact so it will have money to respond to another hurricane. “So the leaders I’ve talked to in Washington, they understand that and they appreciate it,” Abbott said. Mayor Turner cited a mantra he developed over the past five months, as he fretted about when Congress would fund disaster-relief aid for the Houston area. “The funding emphasis on protecting against the next deluge or storm surge from the Gulf has been a key part of our plea to the federal government … Merely funding a recovery would be funding for failure,” he said. The mayor thanked Abbott for bringing the good news to Houston. “Again you are always welcome, especially when you bring bags,” Turner said.